"He who ceases to learn has ceased to be good." Everybody talks about innovations and that's a good thing. But innovation is more than just technical progress; it is a social culture; it means the courage to change. We try to live this culture with our employees. For us, innovation means introducing new technologies, creating better working conditions and ensuring more efficient processes. Continuous willingness to invest and good training and further education of our employees strengthen us in the face of new challenges. We rely on our experience. And on the power of new ideas. 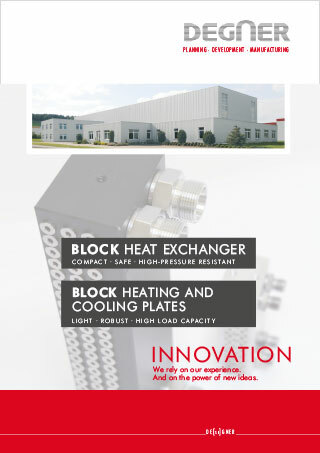 DEGNER developed a universally usable heat exchanger - the BLOCK heat exchanger which is manufactured from a single block thanks to a special technology. There are no seals necessary between the chambers - and thus no risk of leakages. Different flow cross-sections make a use of media with different viscosities possible. Special surface coatings increase the corrosion resistance and extend the service life of the BLOCK heat exchanger. Scalable and modifiable. Custom designs and small quantities. Your individual needs - our efficient solution. DEGNER has developed heating and cooling plates for the universal use. Thanks to a special technology the plates are manufactured from a single block. Individual customer requirements are met by a scalable and modular design. A free design of the external functional surfaces and an adaptation to the object are possible. An optimised temperature distribution leads to a high efficiency. Different viscosities are possible by adapting the flow cross-section. Scalable and modifiable. Custom designs for special solutions.